The Power Block anvil stand features a 12" x 19" laminated wood block that gives you plenty of work space and significantly reduces noise and vibration. An additional shelf has three holes for holding hammers and tongs. The adjustable aluminum legs in a tri-pod configuration offer excellent stability and adjust the total height from 21 " to 27". 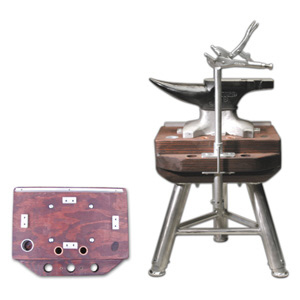 The optional vise mounts to the block and is easily removed for storage.